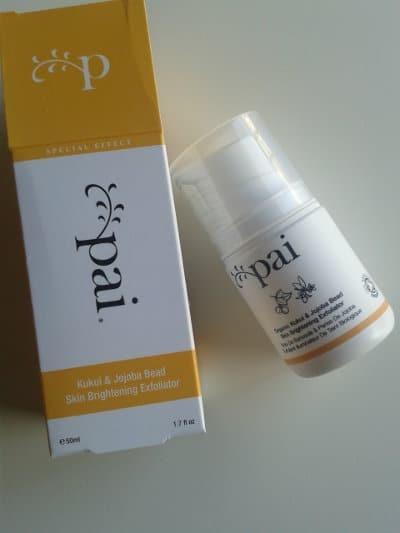 After using Pai Kukui and Jojoba Bead Skin Brightening Exfoliator for some time now and having been very pleased with its skin care benefits, here is my review on this wonderful exfoliating product. 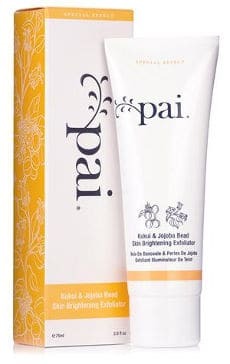 Pai organic exfoliator is designed to be suitable even for the most sensitive skin. Its special formula and the fact that it is 95% organic and free of skin irritants makes it a high quality exfoliator which is perfect for those people who are not using an exfoliator out of fear that it can aggravate or be too harsh to their skin. Actually, I myself was one of these people who thought that exfoliators are mostly products that contain too many chemicals, drying agents and harsh skin ingredients. That was till I found out about Pai exfoliator. What I would also like to add here is that even if your exfoliating experiences have not been so pleasant up to now, good exfoliating is a very important step in your skin care routine. It deeply cleanses your skin, removing dead skin cells and other impurities as well as rejuvenates it, making it feel younger, brighter and smoother. Ultra gentle exfoliator which polishes skin without causing any skin cell damage. 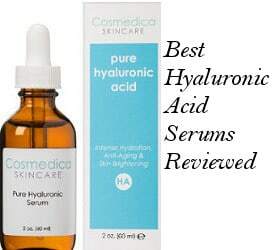 Instantly hydrates and softens complexion. Formula rich in Omegas 3 & 6 as well as vitamins A, D and E.
Free of detergents, alcohol and other skin irritants. 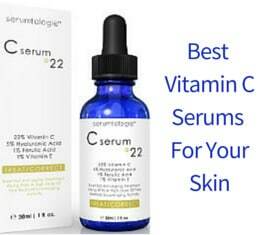 Suitable for various problem skin conditions including acne, eczema, prone to redness or hypersensitive skin. I really love this product’s consistency. It is like a thick gel with tiny beads inside that look like very small bubbles of oxygen. Of course, a big plus is that they are not like those common exfoliating beads that are uneven and can feel harsh on your skin since they are perfectly cylindrical. The beads are 100% natural Jojoba beads and they can’t in any way be compared to those plastic exfoliating beads that are contained in a lot of exfoliators today which are also linked to environmental pollution. The product has to be applied on dry skin and because it is thickish, it takes a little time to apply and massage it all over your face. You need to be a bit careful of how you massage it, just a gentle massage will be fine. Once you finish with your circular massaging, moisten your fingertips and massage again. The gel turns into a hydrating milk which will make your skin incredibly soft. After exfoliating with this product, I feel my skin really smooth and hydrated. I don’t know how this product does it but it is l like my face has been moisturized. It does not dry out the skin but rather makes it feel calm and hydrated. In a way, it seems like this product locks moisture in my skin and it feels totally refreshing. 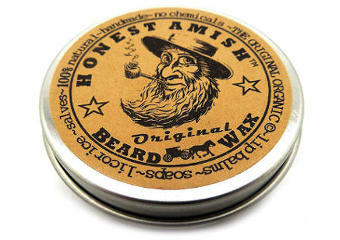 The skin bumps and other impurities vanish and the surface feels even and amazingly smooth and soft. Also, a healthy glow is more than obvious. Overall, in the end of my exfoliation with Pai exfoliator, my skin feels and looks younger, rejuvenated and glowing. I can assure you that for me this is like a complete calming spa experience especially if before this organic exfoliator, I use Pai Camelia & Rose Cleanser, which is a real favorite of mine at the time, and then, Pai Rosehip Oil. What Do User Pai Exfoliator Reviews Say? People are very pleased with how refreshed, soothed, well exfoliated and brighter their skin looks after using this product. They also love the fact that they get all these benefits without any irritation. Still, there was one reviewer mentioning that the product’s consistency felt oily when applied to the skin compared to what she would normally have expected from an exfoliator. To this I would comment that once you apply the gel on your face and you massage it, the product does feel like it has an oily like consistency, but this feeling disappears once you add a few drops of water to it which turns the gel into a creamy smooth product. For me, what matters most is the results you get in the end which is a really smooth, calm and clean skin without any traces of oiliness. Also, another reviewer mentioned that you need to press the pump dispenser harder than other common pump dispensers. I agree with this but that is not because of a faulty pump but because the content is a thick gel which needs extra pressure to be squeezed out of the bottle. Nevertheless, this issue does no longer exist because the company has changed their pump bottle into an easy and comfortable to squeeze tube. After using and reviewing Pai Kukui And Jojoba Skin Brightening Exfoliator, I can say that this is a really unique and effective gentle organic exfoliator that makes my skin smooth like a baby’s every time I use it, feeling well hydrated, rejuvenated and amazingly light. This makes it a skin care staple for me and definitely a product that I will keep on purchasing.